Yesterday was one of those days that I was like "THAT'S IS, I'M DONE!" Everything started out well. I went to the gym, had breakfast with a friend, but as soon as I got home things began to unravel. By the time I was ready to make dinner I was over it. However, me being over it doesn't feed the family. So I decided to head to the kitchen and see if I couldn't just throw some stuff together for an easy meal. That is where this Roasted Chicken with Asparagus and Sweet Potatoes recipe was born. To being you will preheat your oven to 400 degrees. Next spray a baking dish like the one above or a baking sheet. Sweet Potatoes, Chicken, and garlic. Yes, I know that the chicken is not in the image above, but I forgot to take the picture when I put it in. Now drizzle the oil over everything. Toss everything together until it is all coated in the seasoning and oil. Place the baking dish in the oven and bake for 30 minutes, stirring half way through. 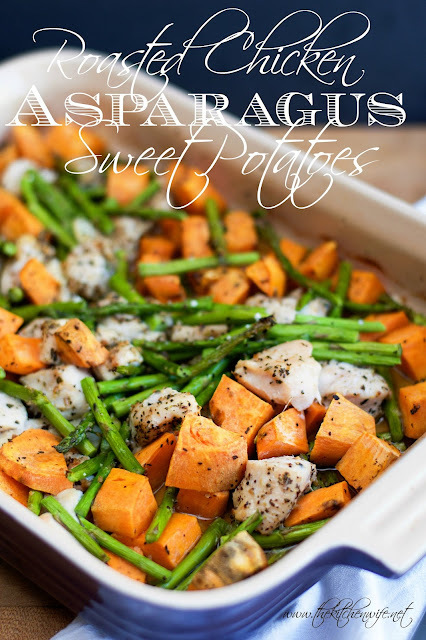 Spray a baking dish or sheet with cooking spray and add the asparagus, sweet potatoes, garlic, and chicken. Season with the salt, lemon pepper seasoning, and thyme. Drizzle the oil over everything and toss so that everything is coated with the oil and seasonings. Place in the preheated oven and bake for 30 minutes, stirring halfway through. This is definitely a dish I want to make. 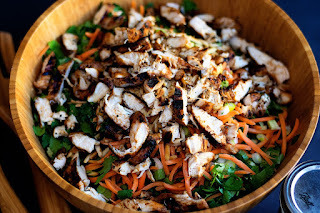 This has really become one of my favorite, simple, go-to meals! I love it! hello there! 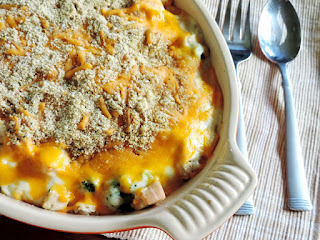 I currently have this dish baking! Thanks for sharing. I hope it comes out well. 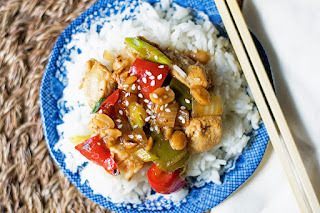 Im aways looking for simple, yet delicious recipes. Very helpful post, keep 'em comin! Hi Georgina! I can't wait to hear what you think! Thanks so much for stopping but and cooking from the blog! Will 30 minutes be enough for the chicken to cook through? Yes. I have made this several times and have never had an issue with the chicken not cooking through. 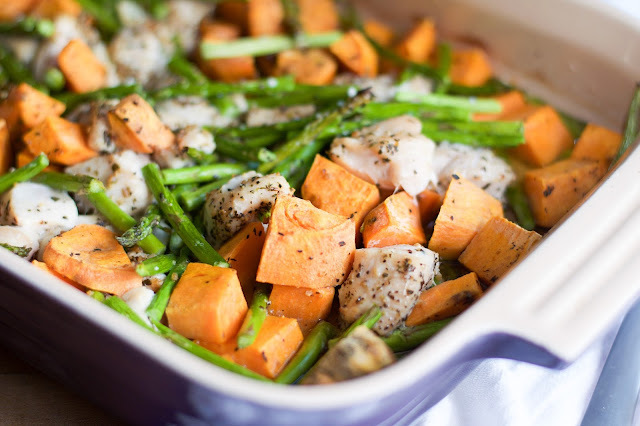 I have so many sweet potatoes on my counter right now, so i'm making this asap! What a great idea! Hey Lady! Yay! I'm so glad you are going to try it! Let me know what you think! Nope! I’m on 40 minutes and it’s about done! Thanks for the feedback. I will make note of this on the post. I will say this, I find that everyone's ovens are different. Gas cook differently than electric, older differently than newer. So that always comes into play.